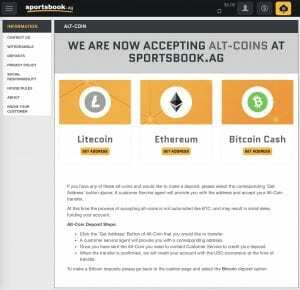 The #PayWithLitecoin campaign seems to be paying off, with Sportbook.com’s acceptance of Litecoin (LTC) into their platform. The decision is coming after the recent Litecoin campaign which has generated many partnership for the altcoin. Sportbook is a prominent online bet and gaming platform known for providing customers with easy deposits to enable them have an easy online betting experience. Rewards on the platform are paid in real cash and at the same time, customers are provided with24/7 online gaming experience. The platform have incorporated Bitcoin in the past, however, it appears that cryptocurrency is helping Spoortbook win massively, hence, the decision to incorporate Litecoin on its platform. The online bet and gaming platform also added Bitcoin Cash (BCH), and Ethereum (ETH), making it four cryptocurrency that can now be used on the platform. As part of its recent campaign, Litecoin was nominated among cryptocurrency to be accepted by Tapjets Inc, an American online private jet charter and air carrier company. In the selection of Ripple (XRP), Verge (XVG) and Litecoin (LTC), the company put a vote on Twitter to determine which of the altcoins to be selected. However, at press time, Ripple is leading with 44%, Verge, 21%, and Litecoin, 35%. In the same line, the PayWithLitecoin campaign is generating more development and creating more customers for the cryptocoin. The Gemini exchange, a creation of Tyler and Cameron Winklevoss, has stated that it is supporting the LTC, Zcash and BCH. The development is an aftermath of the approval given by the New York Department of Financial Services (NYDFS). Gemini, is going to be a major boost for Litecoin due to the number of user base it has. The exchange, has users in 48 U.S states, Washington D.C., Puerto Rico, Canada, Hong Kong, Singapore, South Korea and the United Kingdom, however, it will begin trading LTC anytime from now. Going by Litecoin’s newly signed Non-Disclosure Agreement (NDA) with TokenPay, who just acquired a stake in a Germany-based bank. TokenPay, which has officially closed the deal with the Germany-based WEG Bank has been given the option of acquiring an additional 80.1% of the bank upon customary regulatory approval. However, the NDA agreement, may possibly be purchasing a stake in the bank or partnering on the creation of Litecoin-TokenPay debit card.